In a large mixing bowl or the bowl of a mixer, combine the white sugar and shortening. Beat until well-combined. Add the egg and beat well, then add the sour cream and vanilla and beat for about 1 minute or until the mixture is light and fluffy. Add the flour mixture and beat until combined. Add the orange juice concentrate and orange rind and mix well. Using a cookie scoop, drop the dough/batter (the mixture will be VERY moist–thicker than a cake batter but thinner than traditional cookies) by the tablespoon-ful onto a lined, un-greased baking sheet. Bake for 10 minutes or until the cookies are set and just starting to turn golden brown around the edges. Remove from the oven and allow to cool for 5 minutes, then transfer to a wire cooling rack and cool completely. 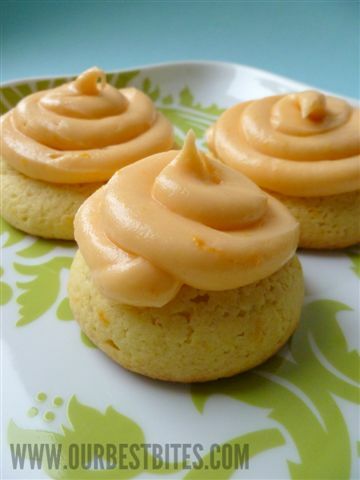 For the frosting, combine the frosting ingredients with an electric mixer until light and fluffy. Pipe or spread over the cooled cookies.